Dracula’s off with Xander, rewriting the rules of magic. Vampires are starting to act strangely under the thrall of their master. And Dawn is having an emotional breakdown over her current mental state. At least Buffy and Giles are clear-headed. Oh wait… not so much. Just another day in a world gone mad. I have to say, when the issue started off, I thought we’d actually get some emotional bonding between Buffy and Spike, considering she was distraught over him bleeding out from his gut wound. But, no, we’re just going to brush that under the rug real quick and concentrate on the big bad Dracula’s evil plan. Maybe one day I’ll get my wish of a healthy and adult relationship between the two of them. Just not today. Instead, there are bigger and badder things to think about. Dracula has stolen the Vampyr book and he’s rewriting magic rules. First order of business is to put himself in a good light, preserving his youth and his status as the supreme ruler of all vampires. He has Xander write up the necessary statements and just like that Dracula is once again eternally young and has vampires flocking to his fancy hotel room to pay him homage. It’s a good gig, if only everything went according to plan. But when has that ever happened? 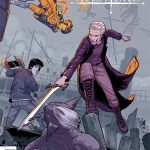 While Dracula’s doing his thing, Spike and Buffy, with Dawn as a tag-along, have hit the streets in an attempt to shake down monsters and find out where Dracula may be hiding away with Xander. They run into quite a few monsters, but no vampires. Curious. What could this mean? Spike’s got the answer, unknowingly tucked inside his head. The grand master vampire has been playing with the book and playing with Spike’s mind, enforcing allegiance from all vampires. With this as a clue, they can try and track down where Dracula is, and hopefully put an end to all the magical mishaps. Dawn hopes they can also put an end to Xander’s mind control, and maybe even help her get back the love she’s lost. When she came back, all her memories came back at once, so she’s been dealing with the emotional trauma of losing her mother, along with other things, all on her own. What hasn’t come back, though, is the emotional connection she has with Xander. She’s working on a high school crush level of love, not the deep, abiding love that Xander has for her, and that she used to have for him. I hope she can regain those feelings again. I may not have been on board with the relationship when it began, but I’m fully behind it now. I want it to succeed. And I also want them all to live, which is starting to become a little bit shaky considering the situation mind-controlled Xander has put them in. In order to counteract those rogue vampires who seek to overthrow their master and take the throne for their own, Xander came up with what he thought was a fool-proof proclamation. “Dracula became the most powerful vampire of all.” This causes a noticeable surge of power going through Dracula and puts a beacon on the hotel for the gang to find, but it also set Dracula on a course of transformation. At first he appears to be a werewolf demon creature, but when all is said and done his true form comes out. Xander’s words caused Dracula to become the Alpha, the one who created all vampires, Maloker. This was not what anyone signed up for! 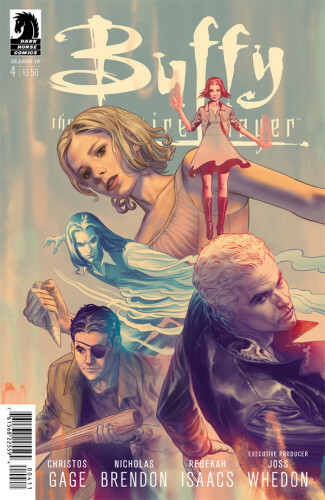 Can Buffy and the gang defeat the ultimate bad? Can Dawn get her emotional connection to Xander back? Can Giles re-learn the magical knowledge that he once held? And can Xander get out from under the spell of Dracula once and for all? We’re in for a roller-coaster ride, I can tell.